is an excellent guide to it’s trails, history and geography. The Hike: The trail starts in the meadows and aspens of the Laramie River Valley. Follow the West Branch of the Laramie River into the Rawah wilderness on trail 960 through deep timber. The route hovers well above the laughing waters below. At 3.7 miles turn right on Rawah Trail 961. After 1.8 miles there is a spur trail that leads 1.3 miles to gorgeous Twin Crater Lakes. The lakes are above tree line in a mat of tundra sheltered by a massive rock bowl scooped from the Medicine Bow range. Back on Rawah Trail 961 continue northwest to the high point of Grassy Pass. The views here are heavenly and the climb will produce more than enough endorphins to really enjoy it. High peaks stretch north and south. The Rawah lakes are like blue and green gems sprinkled into the landscape. Coming down from the pass is a joy. You can count down the Rawah Lakes, beginning with number four, down to one. There are many good camping areas to pick from. Regulations require a 200 foot distance from lakes and steams to prevent destruction of the sensitive vegetation. To complete the loop turn right on Camp Lake Trail 968. At Lower Camp Lake another spur trail leads .7 miles to big Upper Camp Lake, a peaceful wonder of quite and solitude. The Camp Lake Trail gets long and hot. For a couple of miles it follows the lip of an abandoned irrigation ditch then plunges steeply down the forested mountain side past a couple of ruined cabins to join the West Branch trail. Turn east to return to the trailhead. Pointers: These high alpine areas are not heavily used, probably because the hike to them is typically 7 up-hill miles. As an alternative to backpacking, many take a trailer or a tent to the Tunnel Campground and make a long day hike to Twin Crater Lakes, Grassy Pass or to Lower and Upper Camp Lakes. As you might expect, prepare for mosquitoes and bright sunshine. This entry was posted in Colorado and tagged Medicine Bow Mountains, Rawah Wilderness, Roosevelt National Forest. Hi there Roger, thanks for this and all your great posts. They have sparked the flame of many a memorable adventure! Always amazed at all there is to explore from our Cheyenne home base. You are looking at a very early season trip. The Rawah’s would not be good. The trails that reach the lakes would not be snow free until the start of July probably. And we are having a very wet May with fresh snow in all the high country around here. I would consider a low altitude trip. In the Vedauwoo area the meadows on the north side of Twin Mountain are nice but only a couple of miles in. For that trail check out my friends at http://www.JustTrails.com. Seaman Reservoir would certainly be open. See my page on Gateway Natural Area in Colorado. If you are up to a longer drive and would like a desert experience June could be a good time for Adobe Town, Honeycomb Buttes, Boars Tusk and Killpecker Dunes, all in the Red Desert Area. I have never written a post on them but you can find info online and at the BLM office in Cheyenne where you could also get maps. I am wondering about Comanche Peak wilderness, hiking from Comanche Reservoir to Comanche Lake. This area is also off of Colorado 14 but turning south to Pingree Park. Hike Beaver Creek Trail to Comanche Lake Trail. These folks are the Comanche Wilderness experts: http://www.joeandfrede.com/comanche.htm They say mid-June for Comanche Lake. 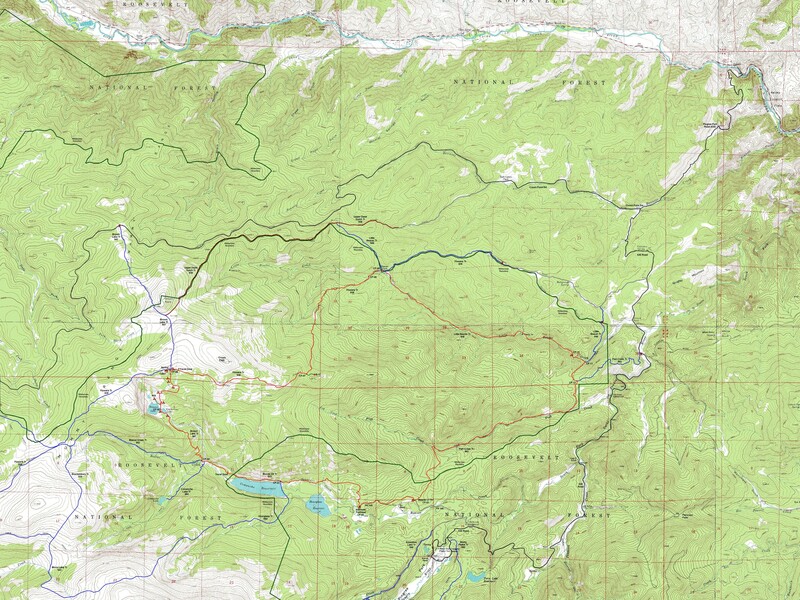 Here is another online map: http://www.ouachitamaps.com/picture_library/Comanche%20Peak/Comanche%20Crown%20Map.jpg I’d call the Forest Service (970-295-6700) to see if the area is open before I would drive up. Wow, what great suggestions, Can’t thank you enough, Roger! Hello, thanks for the knowledge. I was wondering if you knew if it’s easier to come from Blue Lake and meet up with trails #961/968 and then to Upper Camp or start at Tunnel Camp ground? I’m going to Blue Lake this weekend with my kids and then going to do a solo next week to Upper Camp. I thought of doing the solo to Upper Camp starting at Tunnel but I see on the map that I could go up part Blue Lake to #961. Since I’m already going to be 5 miles in at Blue Lake I don’t know if it’s be easier just to keep going?